Ballard is one of the featured guests at this year’s Greatness in Leadership conference taking place in March.He is best known for finding the RMS Titanic in 1985, while on a secret navy mission to investigate two sunken nuclear submarines. “I was a naval officer doing something else, and needed a cover,” he said from his headquarters in Connecticut “I must say, the Pentagon was pissed when I made the discovery. I apologized and said I’d never do it again.” In May, Ballard will hit the open sea to work with Ocean Networks Canada. He and his crew are assisting with efforts to provide improvements to a tsunami early warning system by investigating the Juan de Fuca plate, a tectonic plate subducting under the West Coast. Since Titanic was discovered in 1985, there have been dozens of voyages to the wreckage from government agencies and scientists. But the last time a tourist laid eyes on it was 2005, and the last scientific expedition was in 2010. Technology has also changed a lot in eight years. This time, their five-person sub named Titan will be armed with 4K cameras and a special laser to bring back the best images ever seen. “We can tell within millimeters what the hull is like and create a 3D image of it which we will use in our virtual reality presentation of the wreck,” said Rush. The Museum of Failure in Los Angeles is dedicated to displaying 100 items which are rated in terms of innovation and design before being subjected to the museum’s ‘Fail-O-Meter’. The Harland & Wolff-built luxury liner was deemed unsinkable by its designers but tragically sank on its maiden voyage in April 1912 with the loss of more than 1,500 lives. However, Councillor Sonia Copeland, who represents the Titanic District Electoral Area in east Belfast, said the inclusion of the ill-fated cruise liner in the exhibition is completely inappropriate. “I think it’s disgusting. The Titanic hit an iceberg. That wasn’t a failure of the shipbuilders – it was a failure of nature, so to speak,” she said. 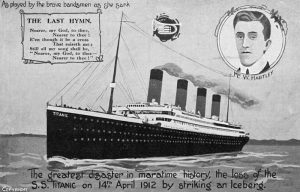 A special set of medals owned by a Titanic crew member whose memory loss may have sparked the liner’s tragic demise is set to go under the hammer. Crew member David Blair was a selfless man who once plunged into the sea to save a life and received an OBE – but he may have unwittingly caused the catastrophic sinking of the famous ship in 1912. That’s because Second Officer Blair was taken off the Titanic at the last minute – and accidentally held on to the key to a locker containing the crow’s nest binoculars. Titanic survivor Fred Fleet told the official inquiry into the tragedy that if they had the binoculars they would have seen the iceberg that took the ship to its watery grave sooner.